These toasties are wonderful whether you are having a party or just a craving! They are quick and simple to make and you can refrigerate and reheat leftovers…if there are any. Cut hoagie buns in half length wise and toast in a 375 degree oven for 5-8 minutes. Remove from oven and set aside. In a skillet, melt butter and add onion, bell pepper, zucchini, salt and garlic powder. Saute over medium heat until vegetables are done. Add spinach and cook another minute, just till spinach is heated through. Cool. In a mixing bowl, beat cream cheese until for 30 seconds, add spinach mixture and mix until just combined. 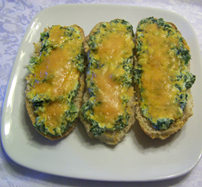 Spread spinach mixture over bread, top with cheese and bake in 350 degree oven until heated and cheese is melted. Cut into slices if desired and serve warm.